First time ever pressed to vinyl! Pressed to vinyl for the fi rst time, this live, double LP, filled with a set of players from all over the jazz, folk, and blues genres, is a great listen for any collector. 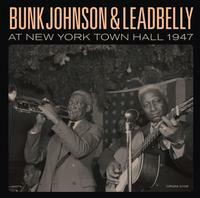 Featuring arists such as Omer Simeon, Jimmy Archey, Ralph Sutton, Freddie Moore, and many more, this Bunk Johnson and Leadbelly collaborative album is definitely one for the books.